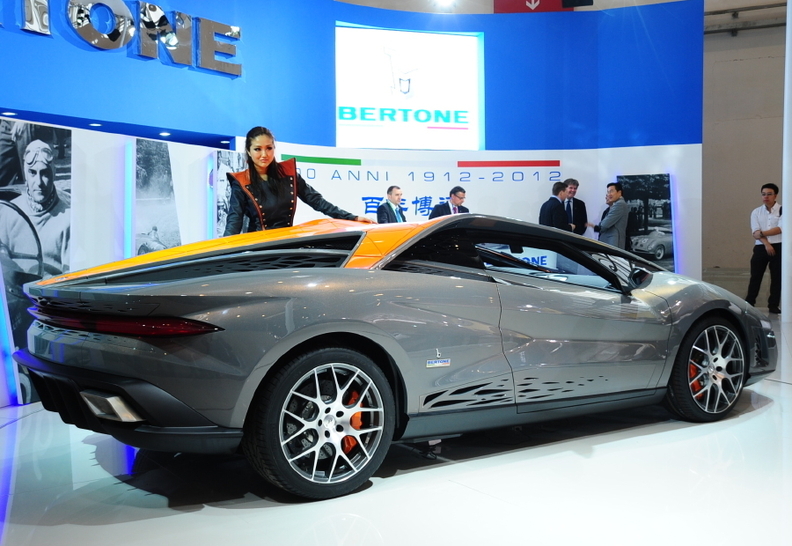 It took Bertone about 15,000 hours to design, engineer and build the Nuccio concept car. BEIJING – Italian design and engineering firm Bertone is in talks with a Chinese car collector to sell its one-off Nuccio supercar. "We are currently in close negotiations with a Chinese collector who wants to buy the Nuccio," Bertone CEO Marco Filippa told Automotive News Europe at the auto show here. The asking price for the Nuccio, which took an estimated 15,000 hours to design, engineer and build, is about 2 million euros, Filippa said. The model, which is named after Giuseppe "Nuccio" Bertone, son of company founder Giovanni, was created to celebrate the company's 100th anniversary. Unveiled as a full-sized styling model at the Geneva auto show in March, the Nuccio was transformed into a road-ready prototype in time to be shown at the Beijing show. Bertone plans to complete the transaction for the car after showing it at the Pebble Beach Concours d'Elegance, in Monterrey, California, in August. Bertone design boss Mike Robinson took inspiration from the legendary 1970 Lancia Stratos Zero concept to create the mid-engine Nuccio, which has innovations such as a tensile steel roof that offers high structural resistance at a low weight.